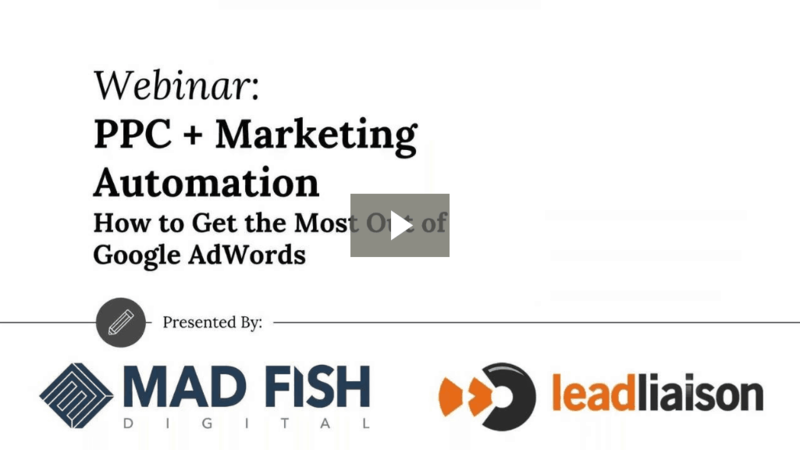 To watch “PPC and Marketing Automation” in its entirety, click here. Google Ads Premier Partner, Ben Herman, and marketing automation expert, Chris Kipgen, team up to cover how using AdWords and marketing automation together can get you more conversions at the same or lower cost per acquisition. *Please note that this content was presented live and then transcribed. It will read exactly as presented in the webinar. Welcome message and company introductions have been removed. [Ben Herman:] The benefits of PPC and marketing automation includes covering the basics. You can quickly deliver a lot of traffic to test CTAs. So those are calls-to-action. That’s landing page optimization. Getting feedback and data on that and not real time but within about 24 hours depending on how much traffic you’re able to drive. You’re also able to gather a ton of customer insights these days from AdWords alone as well as all the social platforms. But there’s demographic data, there’s a lot of age data. Things like that. So there’s a lot of ways to make decisions based on the data that comes back from paid search which makes it really great even if you just run small short campaigns to gather a lot of insight on your customers. And then also the ability to hyper-focus brand messaging and then segment your audiences across the board so that you can properly customize or tailor your messaging to each audience. So the basics of paid search includes your clicks, you’ve got your impressions, your cost, your conversions, and your keyword position when it comes to– This is specific to like AdWords or Bing ads center any time we’re bidding on keywords essentially. There’s performance metrics for each of those. And so the next level of what we call the “Click through rate” the CTR, your conversion rate, and then your cost per acquisition. Those three are the drivers behind the success of any campaign. So we’re looking at all of those on the frontend before data even go in on the Lead Liaison platform. And then of course there’s quality score and if anybody has managed a pay-per-click campaign, they understand that quality score is a big contributor. It’s part of the Google algorithm on the paid search side to help you get the best cost-per-click essentially. So you can have a lower cost if you have a higher quality score and that’s all based on relevance. Basic lever for paid search would be click through rate. We approach all of our engagements, all of the campaigns, we optimize and manage on by starting on the simplistic level and then we kind of boil down to getting a little bit more complex. But on the high level, it starts through click through rate. That’s just your ad copy and really what that means is how effective is your ad copy. And the levers there are updating your ad copy or updating the bids. The levers for quality score, all of it more complex but essentially, it’s going to be your ad relevance. So you can actually get a higher quality score by bidding on less keywords or more specific keywords in an ad group and then making sure that that keyword shows up in the ad headline. Again, not rocket science but time and time again when we go to optimizing campaign, we see ad groups that maybe have too many keywords or they don’t have ads that are relevant. Even if we’re trying to push a quality score from a 5 to a 6 or 6 to a 7, we always just go back to the fundamentals here of looking at ad copy and adjust enough. The conversion rate. Conversions obviously are what we’re all going for. So the levers for conversion rate are pretty simple. What’s the call-to-action, where’s the placement of the form, what does the form look like? Is it three steps? Is it ten steps? What’s the time of day that we’re advertising? So some clients, the sweet spot between 6:00 AM and 11:00 AM in the morning, we tend to see that in like the healthcare side of the healthcare industries. And it becomes really important to make sure our ads are only showing during those key times of day where there’s a higher conversion rate. It can drop as much as half if you get to like 1:00 PM in those cases and then it’s not as effective for your ad spend. So your driving conversions but not every completion of that transaction stage of that funnel is a sale, all right? And so what we considered the conversion as somewhere in the middle to the bottom of that transaction stage of the funnel. But we definitely understand that not everybody is going to purchase. So let’s say your conversion rate on a purchase is 3%, that means 97% of your visitors came and they were interested but they left. So what happens to them? We want to make sure that if it’s not a sale or a purchase, we’re still capturing the data from that conversion. And that brings us to the micro versus macro conversions. And this is where Lead Liaison becomes really important. For the micro conversion, that would be any email or newsletter sign up, a gated content download or request for more information, schedule an appointment. Something that’s a little bit softer than somebody putting in their credit card and basically transacting at that moment. These are all points where putting people into a marketing funnel and tagging and organizing them correctly is going to be imperative to future sales. So you maybe didn’t get the sale today but you didn’t lose the folks that came to your site. You get a higher conversion rate here. So let’s say you’re capturing extra 10 of these people. That’s 10 potential prospects you could keep warm or lukewarm as you kind of market them through or bring them through or nurture them through your sales cycle. Then there’s the macro conversion which is what we all want in the end. So you’re trying to nurture people that didn’t maybe make it to the macro conversion right away. You’re trying to get them to the stage if they didn’t already get there. So that’s going to be your purchase. A webinar sign up for example, a request for quote, an account sign up, or a free trial set up. It’s basically considered. Macro conversions are cash money essentially. That’s when somebody did what you wanted them to do that helps you grow your top line revenue or your sales. You’ve got all these conversions coming through even on the sales, the data needs to go somewhere. And that’s Lead Liaison. So in this case, we’re sending traffic from multiple marketing channel. So that’s going to be your paid channel, your organic channel, paid social. There’s a lot of different avenues for folks to get to a landing page or parts of your site these days that becomes really important that you got your data organized correctly. After the click, data sent to Lead Liaison and Lead Liaison does a great job. We like it for connecting visitor back to what’s called, “Their current session” but that’s basically somebody’s been navigating through a website and the correct tracking them in place, you can actually see in Lead Liaison what page has somebody viewed prior to the transaction as or conversion as well as what maybe they came back to your site later. So future sessions are really important especially for those long sales cycles. You can see who maybe signed up for some information today, and then when they come back in the future which makes it really great for kind of prioritizing prospects for a sales team. Organizing the data up-front, it’s almost just as important as driving that traffic in the first place. We recommend every single client that we worked with that we make sure everybody’s using it – Google Tag Manager. It’s super easy to use. It’s one code snippet and then through tag manager, you use your analytics and any other tracking. That’s how we use Lead Liaison as we embedded it into the tag manager tag. And that allows basically non-programmers on our end to non-developers to interact in that tags to website and get the tracking in place. It saves a lot of cost to our clients because we don’t have to incur dev time. We don’t have to get on a dev schedule and there is almost little to no testing that needs to happen once basic tags are added. There is still some check and balances that need to be there. It’s not just code it and load it. Google got the process streamlined. We use a methodology for labeling or naming your campaigns. It needs to have multiple kind of data points and a campaign name for you to bring it back to the importance or the contribution that that campaign is making to your overall lead funnel. We always put the campaign name, the funnel position. Was it top, mid, or bottom? Right? If you think of that ACT example. Awareness would be top consideration and mid and then bottom is going to be the transaction. So that’s how somebody found you essentially. So were they doing a branded search? Somebody is searching for a brand name of your client then the bottom is typically where that person comes in. But if they are searching for a non-branded term, just a generic keyword that then brings at prospect to your brand for the first time. That’s going to be the top. So we consider that awareness. These are very important when you’re labeling your campaigns so you can organize the data when you’re tagging and sending follow up emails and nurturing people through the full process. Geo target and focus of the campaign are important as well. For different national campaigns, it’s a little bit easier but when you start advertising or having different messaging or different campaigns running in different cities, especially like the higher education realm, it becomes necessary that those are properly labeled as well so you can identify back where this person came from. Maybe you didn’t capture that data bit on the landing page, maybe when they filled out the form there wasn’t a dropdown for what state are you coming from or what city or something like that. You want to be able to easily go back in the future and send messages to these people based on a certain geo area. Your campaign name is a great way to do that. And there’s some other tools in Lead Liaison that let you do that as well. But on the front end, this is what we recommend. The benefits that we get from marketing automation and connecting it back with paid search campaigns, we can nurture long and short sales cycle, we can keep prospects. Basically keep the brands of our client top mind for their– For leads, prospects, for whoever their target audience is that they’re trying to get in front of. Cross promote products and services that works great for kind of even after the transaction, even after somebody has bought something with the number of services or new product that’s available that either complements or matches what they purchased. And then it greatly improves the sales team’s efficiency so when we talk with sales reps and folks in the past they’ve talked with a lot of prospects that were not ready to transact with them or they weren’t far enough for long. They need more information and they’re kind of repeating a lot of efforts. They’re sending them the same info all the time. There’s always processes that they’re doing which are completely automatable in a sales conducive way. There’s still that personal touch to those emails that can be accomplished. And so building a list that evangelizes your new site content, that’s great for you if you’re doing a lot of new blog post. You could send out the list to your people every week of like, “Here’s kind of a run down or our weekly digest.” We do things like that for our own clients just to stay in front and we get such positive feedback about that. Because people are just excited to hear what’s going on at the end of the story. Healthcare, higher education, events and conferences are some of just the easiest one to wrap our heads around when it comes to marketing automation. You can also use it in sports parallel marketing. Marketing automation fits to just about any B2B or B2C sales cycle even if it’s short, even if it’s long. In healthcare, it’s great way for announcing new location, new services, and new specialists. Higher education, it’s great to keep top of mind because folks tend to be researching multiple colleges or advanced degree programs when they’re looking online. And so keep it in front of your folks that have expressed interest without having to use a lot of the rep’s time for follow up, can be really key for kind of nurturing people through each year cycle in some cases. And then announcing campus visits, we see that all the time. It’s really nice when a rep is going to be going to a certain area and they don’t want to mingle around campus or set up a booth. They can do that but we want to let people know that they’re going to be there and it’s a great way to kind of take it from just the click to actual human contact there. And then at events and conferences, you could be very flexible. And one of our favorite features is being able to streamline cross-device messaging. Which is fancy words for saying and utilize push notifications and text messages as well as email. When you let and people know everything from upcoming speaking events to room changes or breakout sessions. Different things that kind of happen along the way. [Chris Kipgen:] For Lead Liaison, one of the first important points are pay-per-click and visitor tracking. So really what happens once they click on that link, it comes back to your website or even just click on a link in general in the case of Google AdWords. We’re also going to talk about ways that we could start to nurture the people who are coming from these ad clicks. There’s a couple different ways to do it and there’s several different ideas that we have. And therefore, so a lot of you are really getting into that automation keys. Whenever the visitor clicks on the link in your paid advertisement, it’s going to redirect into our site. In the case of Google AdWords, we’re fully integrated with AdWords. We have a tracking URL that you put in to AdWords and that basically marks that link clicked and lets our system know that, hey someone has clicked on this particular ad. When it takes you back to website, we’re actually going to place that tracking cookie in their browser. The tracking cookie allows us to remember our visitor from one visit to another and in just a second, we’re going to see how we’re able to remember someone whether they visit a geo six months ago, six days ago, and from the time that they come to your site to the time that they finally convert. And hopefully, eventually, we’ll actually get a sale or a demo or something equivalent out of that. As they keep going through the cookie, we’re going to track every engagement that they do on your website and we’re going to put that into a really convenient timeline. You’ll see in just a second. But when they first get to our website, there’s a couple of things that we get just right off the bat. So using your reverse IP address lookup, we can get detailed information about the prospects location. In many cases, if that IP address is connected to your company, then we can also tell you what company is searching your site. And that’s really valuable to one of those organizations where you’re still doing a lot of outside sales and outside prospecting. It may at least give you a good idea of which company to start targeting. We can also tell you the type of browser and the type of device, if you’re kind of curious. We have more mobile users, we have computer users. We can see all of that just from their visit. In the case of paid searches, we also capture the keywords. And in fact, we can even capture keywords from some organics or just depending on their search settings. In Lead Liaison’s visitor tracking page, we just make sure that we have the right audience here on. With my example, you can see my visitor record that was on the page a little bit earlier today. So the system remembers me. We have me marked just as an employee type. That’s the purple dot is. As I go through here the page, you can see that we’re tracking things like the original lead source that came in firms so paid search would be what you would see from an ad click when they come in. In this case, this is PPC from Google, the internet service provider. I can see things like the site search terms that are in here and again, the state and country. We actually have quite a few other pieces of information that we can choose from as well. If we’re connected to your CRM, we could tell you if they’re CRM or not. Their city. We do actually have a link for LinkedIn so it’ll actually take that prospects based on their company, their name. You can go to LinkedIn. Try to figure out who they are. So a lot of really cool information that’s in there. You can also look into a general overview of that visitor record. So when a visitor first comes in, they’re going to look like this. This is an anonymous profile. So on the visitor tracking page, they’ll be listed as anonymous. That means that they clicked on the ad and made it to your website. They just haven’t done anything to identify who they are. When it comes down to it, there’s no magic sauce. A reverse IP lookup isn’t going to tell us who they are. But this is where we’re going to come in and start helping you figure out who they are piece by piece. So this is the webpage. We’ll first look at our first visit. So we have things like the company, we have the original lead source that’s in the record, we know the general location of the prospect as well. A cool thing I can do is I might want to see what they’ve been doing on my website once they came in. So I can see the website visit and their timeline here and if I wanted, I could actually get a quick instant replay to actually see the steps that they took on my website. So they started on homepage and then they moved through a couple of product pages and then finally, the Contact Us page. So I can get an idea how serious is this person, how long was he spending on each page. It’s a nice little feature that we have in there. Where Lead Liaison comes in, is going to be getting this anonymous profile to what we call, “a known profile”. So as they continue to stay on the website, we’re going to continue to track these engagements. In this case, you can see the anonymous profile. He saw a few dialogues while he’s on the website. So a dialogue is a model or a kind of the old-fashioned term for that is a pop up that may come. In this case, this one says, “Hey sign up for our marketing automation playbook.” And this other subscriber engagement is a newsletter sign up. So just little things as he is browsing, going from page to page. We’re trying to get his attention and pull him in. And very briefly we’re going to switch back to the presentation over here. And this would show you the other ways that we’re able to capture prospect’s information. So we can do that through the form of a one-to-one email. We have a couple plug-ins for Google Mail as well as for Outlook. You could send that email to your prospects maybe a prospecting email asking for a meeting. It’s kind of a first touch sort of thing. We’ll know if they click on the link in that email or not and we can actually pull in their email address and associate a tracking cookie that way. We can associate the tracking cookie through mass email. Classic used case would be a web form. So all of your forms could be integrated to Lead Liaison. Marketing content in videos, both of these things can have an email that we are going to talk about in just a second. And then we have our product we call, “Site engage”. They’re popping up throughout the visitor’s engagements on the website. The main thing when it comes to pay-per-click and these conversions is you want to make sure that that ad is taking them somewhere they’re going to convert. So a lot of times, I’ll see an ad taking prospects to the homepage. You can do things like send them to a landing page that maybe has a video about what you’re all about. Videos seem to have a very high conversion rate. Maybe you would take them to a page that has your product that they can download. But we can use these pieces of content to actually capture the visitor’s information. Email gate and downloadable content is directed straight from our website. So if you were to go to our website right now, and we don’t already know who you are and you’re trying to download one of our web papers, we’re going to ask you to enter your email address received. There’s a couple ways to do this. You can also do a soft gate where you’ll have the option to skip this step if they don’t want to give their email. So it’ll all going to depend on your client-base and on your general market if you feel like you need the hard gate or the soft gate. But this is a great way to convert someone and to get more information. And you know because they’re downloading your brochure. They’re downloading white paper you know they have some interest in the top they just downloaded. Also, on the right, we have a video with an email view. We have an integration through our partner Wistia. So if anyone goes to our website and wants to view our previous webinar, we would be asking for their email. And the cool thing about it is remember, we actually know who that prospect is. Thanks to the tracking cookie in your browser. So if we have already converted them in the past, if we already know their email address, we’re not going to ask them again. We’re not going to bother them by having them enter their email a million different ways on your website. Once we know them, we know them. And what would eventually happen with this prospect, let’s say they were to continue on down the cycle. Is eventually we’ll be able to convert them. So here is a converted profile. With this profile, we’ve identified their email address, their one form of capture or another. We’ll be able to capture their name, maybe we’d get that through your form submission but a cool feature of Lead Liaison, is once we get their email address, we’re going to scan social media. And we’re going to try to find their social media accounts that match up to that name. That match up to their email rather. And if we don’t already know their name, we can pull their name from social media, we can pull their job title, and we can pull a lot of stuff from there. At the timeline, you’re able to see the engagements that they’ve had on your website. Right down to if they watched a video, how much is the video they watched, which parts they rewatched. We can see when they click down links and emails, every visit that they’ve had, what content they’ve downloaded. So it’s a great way of keeping them together. We also have qualified them for you. We do scoring actions. We can score them every time they come to the website. We can also put in grading list. So based on their job title, based from their location, how much of a fit are they for your company. We can give them a grade from there. That way, to see prospects with the highest score and a high grade, you know that these are going to be worth going after compared to some of the others. It’s a very valuable tool but through all of it, we’re always going to remember that original lead source, the pay-per-clicks. So even once they convert, even once they give their email and something else, when it comes to our live reporting, when it comes to just finding out where your prospects are coming from, we’re always going to remember the first way they came to your website. In the case of an ad click, we’ll always have it as the pay-per-click. So it’s a great tool for anyone who’s going to be making new set of paid advertisements. We can use automations in combination with ad clicks in a few different ways. We can send buy signal alerts to our prospect owners. If we have a sales team and inside sales team or even an outside sales team. We can let them know, “Hey, someone has clicked on your ad.” They’ll get the alert right away. They can also know if that come from peak clicks so maybe from a known prospect instead of just an anonymous prospects. We can start tagging those prospects through segmentation so later on you might want to divide and specialized marketing to the people you know clicked on paid ads versus the people who have not clicked them paid ads. And of course once we know them, once we have people converted, we have things like email nurture campaigns. So this could be your standard campaign where we send the email, we wait a week, we send another email, we wait a week. It’s a classic email campaign. Our marketing automation platform is omni-channel marketing. We’re not limited to just email, we’re not limited to things like web forms and other inbound marketing. We can actually do things like direct mail, we can do things with hand-written letters, we can even send out text messages. We also have what we call, “Behavior-based automation.” So this is triggered by the prospect taking new action. And in this case, we can actually say we want this to trigger based on the prospect clicking on an ad campaign. And I can even specify which campaign. These are all pulled in from Google AdWords. So I might say we have a search from 2014, this is a dummy account. Let’s say it’s a search made 2014 ad campaign. If the prospect clicks on the link in this campaign, then I’m going to take the actions well defined on the next page. I can also go down and I can narrow down further. So if I want it to only target people to certain area with a certain job title, with a certain annual income from other company, we have literally hundreds of ways of breaking down their criteria. And as I get into the automations, I can choose any of the actions like from here. So again, the standard campaign, I can send the email, I can wait. Let’s say in this case five hours. I can send another email but I can do things too like add conditions. So I could say if this first email, say 4th of July email, I could add a condition saying if they click on the link in that first email, I’m going to send an email one and if they didn’t click the link, I’m going to send them email two. Or if I learn something else about them maybe if there are one industry, I send them one email. If they are in the other industry, I’ll send them another. But these conditions are basically if then statements where we can build different branches into the automation. And heck I can go so far as to say, “Hey, they haven’t responded to the last five emails we’ve sent them.” So instead of sending an email then, I’m going to send a hand-written letter. And the neat thing about the hand-written letter is we actually will write that letter for you and we have really good handwriting by the way. So it’s not something you have to worry about there. Again we could send you alert, we can upgrade. A lot of possibilities here. The last major piece is ROI reporting on paid search. So this is where we can start helping you on the backend. So it’s great that we’re tracking them. It’s great there we’re sending nurture out to them. But what are you getting out of all this is what comes down to this. This is where revenue appeals. We have reports specifically based on AdWords ad clicks. The clicks, these are imported directly from AdWords. They know how many people have clicked on that ad. The cost is also directly imported from Adwords. Again, the cost is looking a little different because I think we only turned it on for two when we did this test. We also get the CPC or cost-per-click from an AdWords. From there, we can tell you how many people in the system are associated with this particular ads. So how many people had visited your website that had clicked on this ad before. And then prospects, this will be people with their known email address. These are people that actually converted and their original lead source was the ad campaign. And from there, we’re actually able to tell you the cost per prospect. So we can take the initial cost divide it by the prospects and there’s your cost per prospect. A good example of this is when I was working with a client a couple of months ago and he saw that he has an ad campaign. He’d spent roughly $10,000 on over the course of eight months. Added those $10,000 he only had a handful of converted prospects so yeah but 6,000 people visit his website and that’s okay but only a few of them actually converted. His cost per prospect was something to the effect of $80 per prospect. And that was insane to him as it used to be. Versus a couple down, there was another ad campaign where he had spent a similar amount on it but it had a much higher conversion rate. And this case, he was actually taking them to a different part of his website and his cost per prospect was a much more reasonable $5-$6. So obviously, he pulled one ad campaign and started other ad campaigns instead. It’s great information, its great insight for you. If you’re using Salesforce.com or Microsoft dynamics, we also have very deep connectors with them into their CRMs. So we can take it a step further and we can also tell you how many opportunities are associated with prospects that would come in from these campaigns. We can tell you the cost per opportunity and the total value and then finally, we can tell you your revenue and your total ROI. So we’ll use the revenue as your cost– Or the revenue likely cost and that’s where you’ll get your ROI percentage from. And the idea here is you want to have a very high ROI. I think we can all agree that that’s the end rule marketing that’s going to get ROI on it. And we can go a little further than this too. Not only can we look at the individual ads but we can also look at keywords. So in this case, I can see the keywords for the people who are looking– The people that I have my one opportunity with $17,000 here, they had searched for visitor tracking stuff were Egypt. So for whatever reason, I now know that I have people looking for visitor tracking software in Egypt. You know it. I’m getting opportunities out of them. So maybe I’m going to expand my location in Egypt a little bit more. Maybe I can focus more ad revenue there. Create some personalized content for it. That in a nutshell, are a few of the things that Lead Liaison can do in combination with AdWords. So there’s a lot to it there. Hopefully you saw similarly neat ideas or new– Or come up with something you might want to try a little later on. Q: Is there a threshold for visitor tracking? So how many sessions can it record? So for visitor tracking, we do not have a set threshold. So we don’t cut it off after a hundred visitors or anything to that effect. We have some clients where we’re tracking hundreds of visits per day and remember, we’re tracking every unique visitors. So even if we don’t know who they are already, if they’re just anonymous, we’re still going to be tracking that. So again, no major limit to it. There might be some stipulations in the license where we’ve agreed on a certain number of visitors per day but that would have been done beforehand when we were analyzing your website for the amount of traffic. So we customize it to your site but we’ll never cut it off, we’ll never stop tracking people, we’ll never say no if you have too many. Q: In regards to prospect profile, can you manually add it? The score. I think there is this score up there I think the one that you showed was about a thousand. Can you change that based on your business? Yes. So there’s a couple ways of changing the scores. So first off, you can change the baseline scoring. When I say baseline scoring, I’m talking about each individual engagement that we have in there. So as for example, website visit would be a 10 points normally for your organization, you make it a ton of visits. You might want to lower that to 5 points from the baseline tracking just as one example. You can change it for a particular prospect just like going in their profile and actually changing the score. And then you can also come up with custom scoring list. You might have a combination of engagements instead of just one engagement that you think has a closer buying signal and you’re able to do that for sure. Q: Do you track multiple score touchpoints? Multiple source touchpoint. So we will attribute the original lead source to whatever the first ones they come in on because we feel it’s very important. So let’s say they start with your website by clicking on an advertisement. Even if six months later they convert from watching your video, they’ve have a million different sort of visits, we know that it’s still very important to say, “Hey, this first one is how they’ve heard about you.” But we do track all of their different touchpoints. We do have other reporting or a live report so you can see how your different campaigns and different pieces of content have been effective. Q: Is visitor tracking IP or cookie related? It can be either. Normally, it’s going to be through a tracking cookie in the browser. And that’s going to be by far the most accurate way to make sure that it’s the same visitor coming through. We do realize in some locations, we have a lot of European clients. We do realize that cookies are a little bit stricter over there so we do have the option of doing IP tracking only. Which will use a combination of the IP address and browser session information to making connection with the prospect. Q: With people using a private page on a web browser, are they being tracked as well? Yes they are. Because there’s no cookies on a private page like for an incognito mode in Google Chrome for instance. Since that is a cookie-free sort of browser, when they come in, they would pop up as a new anonymous profile. However, if they did a conversion action like they put their email address in or anything else, we would then know that that session belongs to that prospect and we will put it into the appropriate profile. Q: So you mentioned the ability to send text messages. Is that in the automation tab of Lead Liaison? The text messages are done via a web hook with Twilio. So it’s actually going to be under settings app set up and web hooks you created there. The prerequisite for that is you would have to have your Twilio account and get the web hook information from them. If you would like to set that up or would like more information, you can send an email to support@Lead Liaison.com. They would be more than happy to give you the documentations and detailed instructions. And then once you get that set up, then you can all as part of the automation. So it would be in the automation area once you’ve completed the set up. Once the web hook is set up, then in the automation there is a seen web hook action. So just like you saw over the emails you just drag over the web hook action and that would tell our system to send the text message over the Twilio and that would send the text out. And the cool thing is, those text do support data merge fields just like emails do so it can be personalized down to the individual person’s name, company, and such. Q: Can Lead Liaison be used in place of email marketing platform? Yes. That’s actually a major part of our platform. It’s built into it so when you set up with us through marketing automation, we set you up and records just like you would with a platform such as Woodpecker. We do email templates, we’re able to handle the bulk sending. Some of our larger clients were looking at sending out hundreds of thousands of emails per month. So we’re able to handle that with no problem. The neat thing about using us for your email marketing is then all of those emails are tracked within Lead Liaison. So the emails opened are tracked, if they clicked on the link on the email, that’s tracked, it’s scored. So it’s really neat, it is for full email marketing platform but it’s combined with marketing automation into one seamless experience. Q: Who is your target customer for Lead Liaison? For example, what is the typical ad spending out organization size of client who then purchase Lead Liaison? I would say we take all. That’s going to be a really general question. So I think any customer is a target customer for Lead Liaison. I see ways that we can help businesses of all sizes. We currently and manage a lot of the client relation side of Lead Liaison and we’ve got clients from very small companies to very very large companies. And implementation is about the same across the board and I see help going in all different direction. So I would say there’s really not a target. So they’ve signed on with Lead Liaison, I can tell you from the accounts that I’ve worked with, the accounts that I’ve managed, I think my smallest account, they have something to the effect of like 500 prospects or even that. And they’re sending emails out of it and then I have other accounts where again, we’re talking about sending hundreds of thousands of pieces of content out on a monthly basis. We have one just yesterday, I was helping them out with something that, email as going out to 75,000 prospects of one. So we really do have everyone from like small small businesses where there is like four or five people in an office all the way up to enterprise level. Where we have huge number of employees so we can support really just about anything there. Of course we do different marketing efforts for those different kinds. But that’s the great thing about marketing automation is it’s no extra work for us. We just put the content in and the system is able to sort it from there. Interested in the solutions that you heard about in this webinar? Request a personalized demonstration today! Why is SEO Necessary for a Marketing Automation Strategy? Is Marketing Automation a Good Idea?